You are here: Home / Podcast / When Does Bodyweight Matter? There are many different metrics you can use to measure a change in your body shape and composition. The short list includes, bodyweight, bodyfat %, and the circumference of your waist, hips, and shoulders. All of these measurements can be made at home relatively easily with a decent degree of accuracy. At what point does the scale become useless? 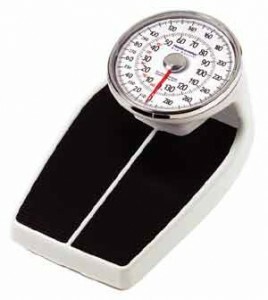 All you need is a scale, a cheap set of bodyfat calipers, and a measuring tape and you can keep a pretty good eye on the shape and composition of your body. These metrics can give you a snap shot of where you’re at during any given point in time, but how much information will they give you about how much you are changing over time? The answer to this question is dependent upon where you currently are. If you’re BMI (Body Mass Index) is in the overweight or obese category it’s likely that the only metric that is even worth measuring is bodyweight. Indeed if one is large enough calipers are problematic to use, and it may not even be obvious where to put the measuring tape to get a true ‘waist’ measurement etc. The point is when an individual has between 50-100lbs to lose, bodyweight itself is likely your most useful measurement tool. The goal is simply weight loss, regardless of what the weight itself even is…it will likely be a mix of bodyfat, excess body water, and even some pathological forms of lean mass (remember not all lean mass is muscle mass). Reducing total bodyweight is the key for people who are in upper range of the overweight BMI and all those in the obese range. Once your bodyweight enters the ‘normal’ weight range of the BMI things like bodyfat % and the tape measure on the waist, hips and shoulders (as well as arms, legs, chest etc) start to tell more of the story. Bodyweight becomes less useful as you approach the 10% bodyfat range, and becomes almost totally useless below this level. As a woman approaches the mid to low teens in bodyfat % the only thing left to track changes is the mirror. In today’s podcast, we’ll discuss where the break points are for using body weight, body fat % and measurements as an accurate way to track progress. In the end the only measurement that will truly matter is the mirror.